Home / Gossip / ‘EastEnders’ Spoilers: Will Max Branning Seek Revenge On Dying Phil Mitchell? ‘EastEnders’ Spoilers: Will Max Branning Seek Revenge On Dying Phil Mitchell? ‘EastEnders’ spoilers have been teasing Max Branning’s Christmas return for weeks now, and it’s finally here. TPTB at ‘EastEnders‘ have been pretty tight-lipped regarding Max Branning’s [Jake Wood] agenda when he arrives in Walford. Regardless, longtime ‘EastEnders‘ fans who are familiar with Max’s storyline are certain that there will be fireworks. After all, Max Branning has quite a few axes to grind after being set up for a murder he did not commit. ‘EastEnders’ spoilers tease that Ian Beale [Adam Woodyatt] will be shaking in his boots upon Max’s big arrival, and for good reason. Ian knew that Max was not his daughter Lucy’s killer – but he saw to it that Max went away to prison for the crime he did not commit. Since Branning was off the canvas, Ian even received a threatening note from Max. Let’s be honest, it’s not a coincidence that Ian Beale receives haunting Christmas cards from his dead daughter Lucy the same week that Max returns. But, Ian Beale is not the only person that wronged Jake Wood’s character – what about Phil Mitchell [Steve McFadden]. Related: Mitchell Family’s Emotional Holiday – Phil Dies On Christmas Day? But, Ian Beale is not the only person that wronged Jake Wood’s character – what about Phil Mitchell [Steve McFadden]? 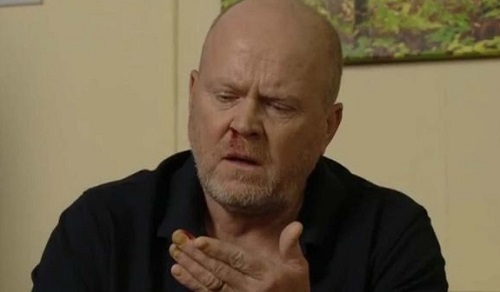 ‘EastEnders’ spoilers have teased that Phil Mitchell is at the end of the line, if he doesn’t get a transplant ASAP, this Christmas could be his last Christmas. 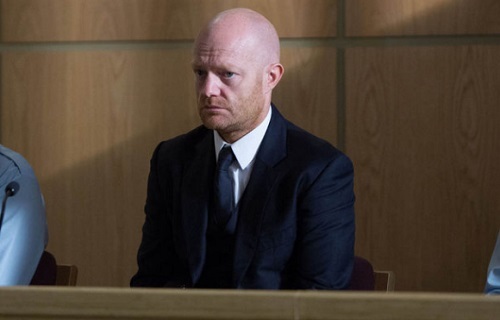 Phil Mitchell and Max Branning have always had some bad blood between them, and Phil actually paid off one of the jurors during Lucy’s murder trial to be certain that Max would be sent away. When Max returns and sees the kind of shape that Phil Mitchell is in, will he seek revenge, or will Branning take the high road? Is there anything that Max could do to Phil that is worse than what he is already going through? What do you think ‘Eastenders‘ fans? Will Max Branning seek revenge on dying Phil Mitchell? Share your thoughts in the comments below, and don’t forget to check CDL for all of your ‘Eastenders‘ spoilers and news. There’s nothing quite like Christmas on #EastEnders. ← Previous Story LeAnn Rimes Worried Eddie Cibrian Is Cheating With Jaina Lee Ortiz, New ‘Rosewood’ Co-Star?